CASology: Week 145: Weekly Winners! I love how Carol spotlighted her little dancer with a masking/blending technique. The wavy sentiment is perfect to balance the movement on her card. 1. Ardyth's Choice: Rahmat's use of outline flowers make this CAS card feel light and airy! 2. 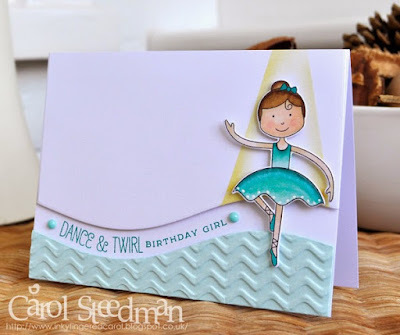 Judy's Choice: Lisa's fun card brings a circle shape to a new, amazing level in this CAS card! 3. 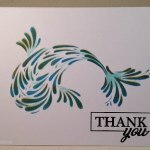 Joyce's Choice: I love how Bev's graphic fish is made up of distress blended stenciled shapes. 4. Jen's Choice: Henriette's sweet ombre circles are the perfect accent for this CAS baby card! 5. 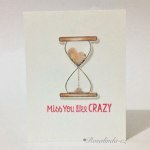 Kimberly's Choice: Rosalinda's made a clever shape to represent time missing someone. Congrats! 6. 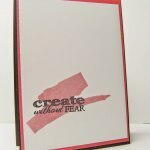 Hazel's Choice: I loved Sandie's take on 'shape' as a verb! Simple, yet powerful CAS layout. Fab! 7. Kymona's Choice: Joanna's card made me smile. 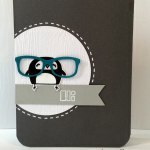 Those glasses are a perfect shape for the penguin! Be sure and stop back in an hour for challenge #146! Congratulations to all! Yes! Love the way Carol did the spotlight. Awesome! Thank you for the HM, congratulations to Carol, and all the other HM's. 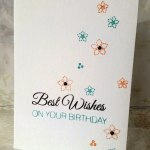 Hazel thank you so much for choosing my card I am thrilled. Congrats to all winners. Jen, thanks for the HM. Congrats to the other ladies as well.